French painter. 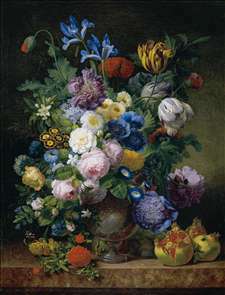 He was apprenticed in Lyon for six years with his brother Jean-Pierre-Xavier Bidauld (1745-1813), a landscape and still-life painter. Subsequently, they left Lyon to travel together in Switzerland and Provence. In 1783 he moved to Paris, where he met Joseph Vernet (from whom he received valuable advice), Joseph-Siffred Duplessis and Jean-Honor Fragonard. In 1785 he went to Rome with the assistance of Cardinal de Bernis and his patron, the dealer and perfumer Dulac. 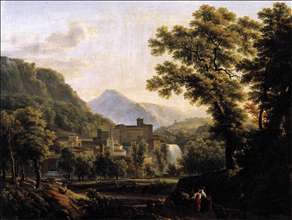 He stayed there for five years, travelling through Tuscany, Umbria and Campania and painting such works as Roman Landscape (1788; Basle, Kunstmuseum). Bidauld was closely involved with the circle of French Neo-classical painters in Rome in the 1780s. He was friendly with Louis Gauffier, Nicolas-Antoine Taunay and especially with Guillaume Lethiere, who became his brother-in-law and with whom he occasionally collaborated. On his return to Paris in 1790 he travelled extensively in France, visiting Brittany, the Dauphin and in particular Montmorency, where he stayed in the Mont-Louis house that had been the home of Jean-Jacques Rousseau. 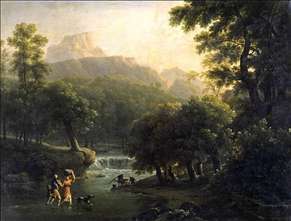 Between 1791 and 1844, Bidauld was a regular exhibitor at the Paris Salon and won a Gold Medal in 1812. Unable to abandon Neoclassicism when it fell out of style, his work lost demand and Bidauld died in poverty. See more details about "Landscape with Figures Crossing a River"
See more details about "View of the Isle of Sora"